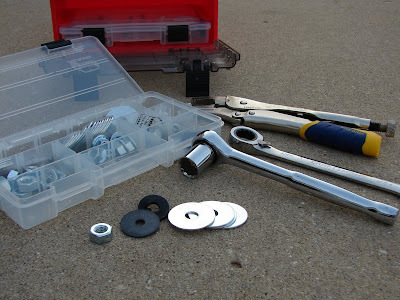 Take the time to assemble a nice kit of tools you will need for your sectional kayak. For the Valleys, it takes a 17mm socket wrench, some Hillman rubber washers, a pair of vice grips, a few flat fender washers, and most importantly, some spare 17mm nuts. I keep this kit on land in the vehicle. If I were going on a long paddle or overnighter, I would likely bring one spare setup (fender wahser, rubber gasket, bolt and nut 17mm, and a simple 17mm wrench.